“It’s safe to say my mom hasn’t [cooked] for family holidays since I was 12,” jokes Naomi Hazan, a 24-year-old personal chef and kosher food columnist who has taken over those duties. For the holidays and shabbat, Naomi makes Syrian recipes like kibbeh garaz, or meatballs with rice stewed in garlic and cherries and lachmagine, a meat-topped flatbread. Naomi's Grandfather Yaakov and Grandmother Rashel in Syria in the 1940's. Like many of us, Naomi learned these dishes from her grandmother — but a grandmother whose recipes she didn’t know well until she was almost 10. In 2004, Naomi’s family made aliyah, moving to Israel from New York, to be closer to her father Leon’s family in Holon, outside of Tel Aviv. Her grandmother Rashel and the family moved there from Aleppo, Syria in 1959, as anti-semitism grew in the city. “They had to flee in the middle of the night,” Naomi explains. They drove to Turkey to board a boat that carried them to Israel. Settling in came with more challenges. The family had to learn a new language and “the basics of how to interact in a new country,” Naomi says. They moved into a largely Ashkenazi section of Tel Aviv and were taunted by neighbors for being from an Arab country. But, “these people are tough in their blood,” Naomi adds. “My grandmother was definitely tough.” She held onto the family’s Syrian customs and recipes that called for sour tamarind and pungent allspice, and a heavy reliance upon mint and garlic. Naomi’s introduction to these recipes came when she arrived in Israel. 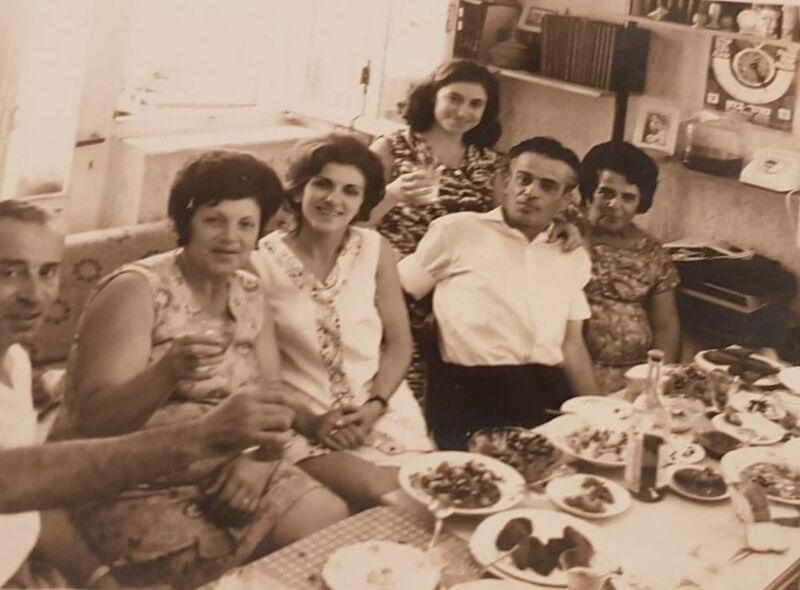 Rashel, known as savta or grandmother in hebrew, would host regular family meals. “Sometimes, we were 40 grandchildren,” at the table, Naomi explains. To feed the family, she would make a large pot of what the family calls bulrul, or bulgur with fried onions, vermicelli, and chickpeas. “It’s similar to that one pot meal that Italian grandmas would make, it never runs out,” Naomi explains. In Syria, it was a dish that housewives made on laundry day, when they were too busy to prepare something else. “A typical Syrian dishes can take hours,” she adds. To flesh out the meal, Rashel would also serve a yogurt sauce made with Persian cucumbers and mint, pickles, tehina, and two salads, one with cabbage and another with tomatoes and cucumbers. And there was always baklava, drenched in a sweet rosewater syrup that perfumed her kitchen. In 2009, when Naomi’s family decided to return to the United States, she started to ask Rashel about her cooking. Like many grandmothers, Rashel didn’t have any recipes written down. In Brooklyn, she no longer had the weekly family meals, “so I had to teach myself,” Naomi adds. She started to buy cookbooks and to practice the recipes she remembered from Israel. “It took a couple of holidays, maybe a few years,” even, she says, to master Rashel’s recipes. But, “now I’m pretty much a walking cookbook,” she says. Thankfully, she wrote these ones down for us. 1. In a medium pot, heat the oil over medium heat. Add the noodles and sauté, stirring constantly, until lightly browned, about 2 minutes. 2. Add the bulgur and salt and cover with water by ½ an inch. Cook covered over medium-low heat for 20-25 minutes until bulgur is tender. Remove from heat and let stand for 10 minutes covered. 3. Meanwhile, add the onions and oil to a cold medium sized pan and sauté over high heat for 20 minutes until the onions are softened and golden brown. For a more charred onion, let the onions continue to cook for about 5 minutes, stirring occasionally, until they are dark and start to get crispy. 4. Top the bulgur with the fried onions and chickpeas and serve at room temperature with cucumber mint yogurt and salad. 1. Grate the cucumbers over the large holes of a box grater. Place the grated cucumbers in a strainer positioned over a bowl or the sink and top with the salt. Use the back of a spoon to press out all of the liquid. 2. In a medium sized bowl, combine the cucumbers, yogurt, garlic, lemon juice, lemon zest, and mint and mix to combine. Refrigerate for 15 minutes. Serve cold with “Laundry Day” Bulgur with Fried Onions. 2. Make the syrup: In a small saucepan, bring the sugar and water to a boil until the sugar is completely dissolved. Add the rosewater and salt. Lower the heat and simmer until a slightly thicker syrupy texture forms, about 15 minutes. Remove from heat and let cool completely (you can stick it in the fridge if necessary to speed up the process). 3. While your syrup simmers, make the filling: place the walnuts, pistachios, sugar and cinnamon in the bowl of a food processor and pulse until coarsely ground (around 10 pulses). Set aside. 4. Unroll the phyllo dough. Place a 9x13” pan over the dough and measure and trim it to fit your pan. Discard the scraps and cover the dough with a damp cloth to keep it from drying out as you work. 5. Using a pastry brush, grease the bottom and sides of the pan with the melted butter. 6. Layer 12 sheets of the phyllo dough into the pan one at a time, brushing each sheet with butter before adding the next and keeping the remaining dough covered with a damp towel as you work. 7. Evenly sprinkle the nut mixture on top of the 12th sheet of phyllo. 8. Layer 12 more sheets of phyllo on top of the nut mixture, brushing each with butter before adding the next. Be sure to brush the final, top layer generously with the butter. 9. Using a sharp knife, begin to section the baklava. Cut four even 1 ½ inch rows vertically along the longer edge of the pan. Be sure to cut through all of the layers of phyllo dough to the bottom of the pan. Then, cut diagonally across the pan from corner to corner to form 1 inch wide diamond shapes. 10. Bake for 20 minutes on the bottom rack of the oven, then transfer to the top rack of the oven and bake for an additional 15-20 minutes until golden brown. 11. Remove from the oven and immediately spoon most of the cooled syrup over the hot baklava (listen for the crackle!). Let cool for at least 1 hour before serving, best if you wait overnight. 12. Store in an airtight container or freeze for up to 2 months.